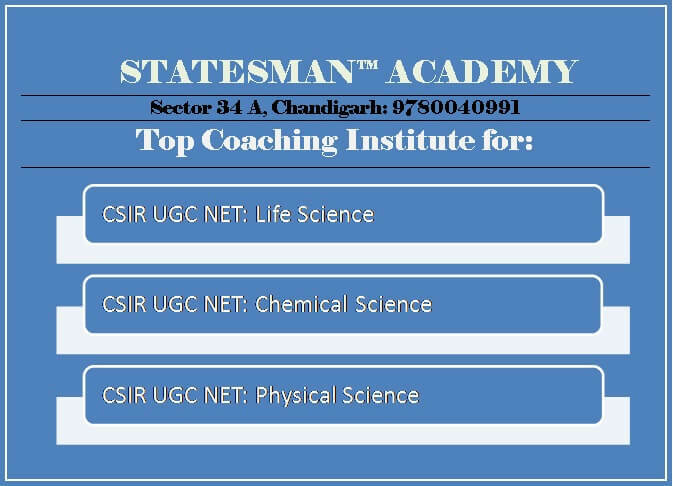 CSIR NET Coaching in Chandigarh: Statesman Academy is known as best CSIR UGC NET coaching institute. Our objective is to prepare candidate to score best in this exam. STATESMAN ACADEMY relies on hard work and sincere efforts on the part of teachers as well as on the part of students. We work with honesty, integrity and transparency to accomplish best outcomes in tutorial Services. For more than 7 years, STATESMAN ACADEMY, has been indomitably and persistently producing top ranks in the field of CSIR NET COACHING. This endeavour is still in progress with every successive year with more top positions at all India levels. All the credit for this immense success goes to our dedicated faculty who with their painstaking efforts guides our students with utmost care and commitment. Council of Scientific and Industrial Research (CSIR) established in 1942, is an autonomous body and India’s largest research and development (R&D) organization. This multidisciplinary and multilocational council runs 39 laboratories and 80 field centers which carry out fundamental and applied R&D in all areas of science and technology. The research and development activities of CSIR includes various fields such as Aerospace, Engineering, Structural Engineering, Ocean Sciences, Life Sciences, Metallurgy, Chemicals, Mining, Food, Petroleum, Leather and Environment. CSIR was established with the aim of promotion, guidance and co-ordination of scientific and industrial research, collection and dissemination of information on research and industry, founding of laboratories to carry forward scientific and industrial research and utilization of the new knowledge so generated for development of industry. Council of Scientific and Industrial Research, provides Junior Research Fellowship (JRF) to those who qualify the joint CSIR-UGC Joint Entrance Test for Junior Research Fellowship and Eligibility for Lectureship (LS) i.e. National Eligibility Test (NET) conducted by CSIR twice in a year. BS-4 years program/BE/B. Tech/B. Pharma/MBBS/Integrated BS-MS/M.Sc. or Equivalent degree with at least 55% marks for General & OBC (50% for SC/ST candidates, Physically and Visually handicapped candidates). Candidate enrolled for M.Sc. or having completed 10+2+3 years of the above qualifying examination are also eligible to apply in the above subject under the Result Awaited (RA) category on the condition that they complete the qualifying degree with requisite percentage of marks within the validity period of two years to avail the fellowship from the effective date of award. B.Sc. (Hons) or equivalent degree holders or students enrolled in integrated MS-Ph.D program with at least 55% marks for General & OBC candidates; 50% for SC/ST candidates, Physically and Visually handicapped candidates are also eligible to apply. Candidates with bachelor’s degree, whether Science, engineering or any other discipline, will be eligible for fellowship only after getting registered/enrolled for Ph.D/integrated Ph.D. programm within the validity period of two years. This part shall contain 75 questions that are designed to test a candidate’s knowledge of scientific concepts and/or application of the scientific concepts. The questions shall be of analytical nature where a candidate is expected to apply the scientific knowledge to arrive at the solution to the given scientific problem. A candidate shall be required to answer any 25 questions. Each question shall be of four marks. The total marks allocated to this section shall be 100 out of 200.